When I was working on Vegetarian Entrees (which I got an advance copy of a little while ago and looks fantastic! ), my friend/editor Matthew from the Experiment told me something that surprised me: he’d read somewhere that sandwiches are the most popular meal in America. I spent some time probing the internet, hoping to find such data, but I didn’t get anywhere (maybe you know something about this “study”?). And it did seem silly at first, but then I spent some time thinking about it and, duh, of course sandwiches are the most popular meal in America. A sandwich can be anything on bread. Moreover, they’re easy, portable, nourishing, and can run the gamut from peanut butter on bread to . . . anything really. And what’s not to love in a sandwich? It has the same appeal as a burger, veggie or otherwise. A burger is technically a sandwich! As far as I’m concerned, a sandwich is only as good as the bread you serve it on. Nothing can ruin an otherwise good sandwich like stale or dense, flavor-suffocating bread. And, similarly, nothing gives ho-hum fillings a facelift the way delicious bread can. I really don’t like it when bread is gooey. Some store-bought sandwich bread seems to rely on a preservative that makes it turn into roof-of-mouth-adhering paste when it makes contact with saliva. (I always feel like a dog that accidentally ate peanut butter when I eat it.) Bread I like has structure—it stands up on its own, springs back when you press it with your finger—as well as a good crackly crust and a deep, toasty, slightly tangy flavor. And then I’ve been thinking a lot about ways to put leftovers to use. I love oven-roasted broccoli, so much in fact that leftovers aren’t often a problem. But by some feat I had a container of it in the refrigerator and remembered a broccoli sandwich I ate a few months ago at No. 7 Sub, a sandwich shop in Manhattan that’s pretty delicious (and has a some great vegetarian options). 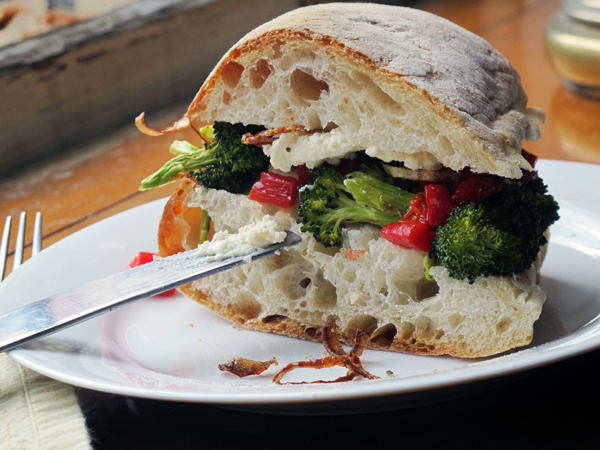 That sandwich takes a couple big squirts of mayo, as well as toasted pine nuts and ricotta salata. I took things in a slightly different direction with creamy ricotta, roasted red peppers, and—drum roll, please—crispy fried onions. 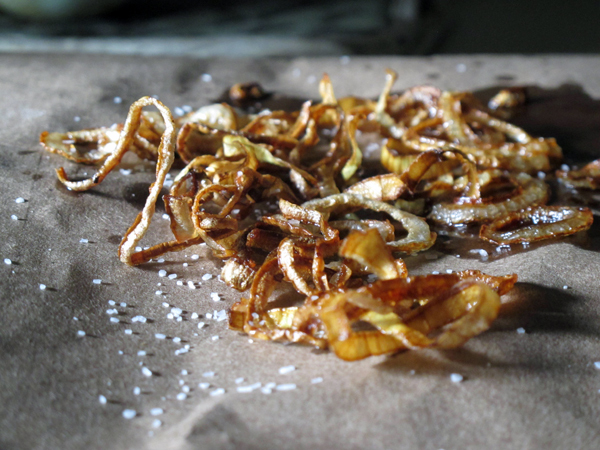 Crispy fried onions are one of those Little Black Dress toppings that every cook should keep in the kitchen. They’re so easy to make and endlessly useful. You can put them on other sandwiches, veggie burgers, salads, casserole-like dishes, even on a bowl of rice or your favorite curry. Then strain the leftover oil and save it in a metal or glass jar; it will improve in flavor as you continue to cook with it. Use whatever leftover cooked broccoli you have, or your favorite recipe. If you’re making my (very basic) recipe below for something other than these sandwiches—as a side dish, for example—I’d double it. It’s pretty good, and the yield below probably won’t make for leftovers. And you’ll also have some extra crispy fried onions, but you can thank me for that later. Toast the bread if you’d like. 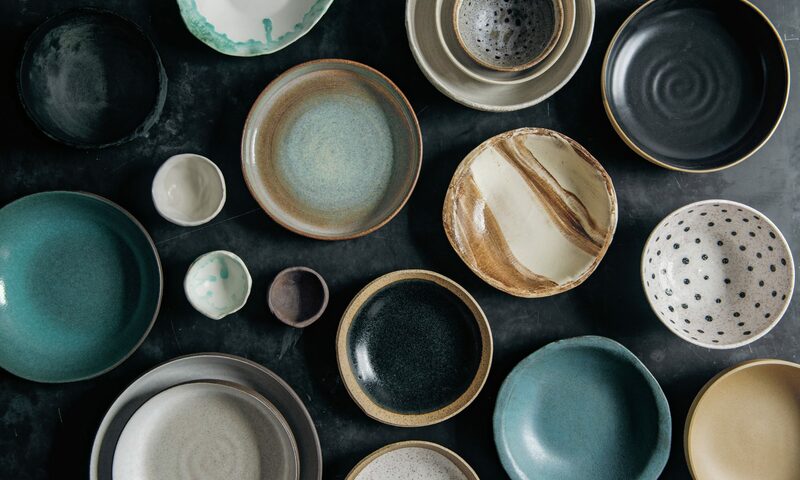 Halve the rolls, if using, and lay out the bread on plates or a cutting board. Divide the broccoli among the two bottom halves, followed by the half of each the peppers and the onions. 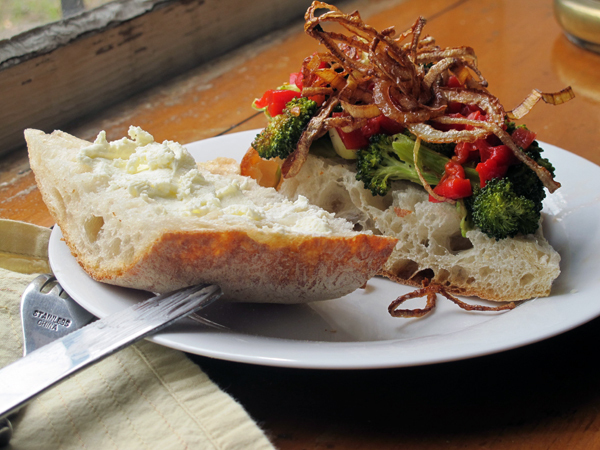 Spread 1-1/2 tablespoons ricotta on each top half of the bread, then close up the sandwiches and eat. 2. 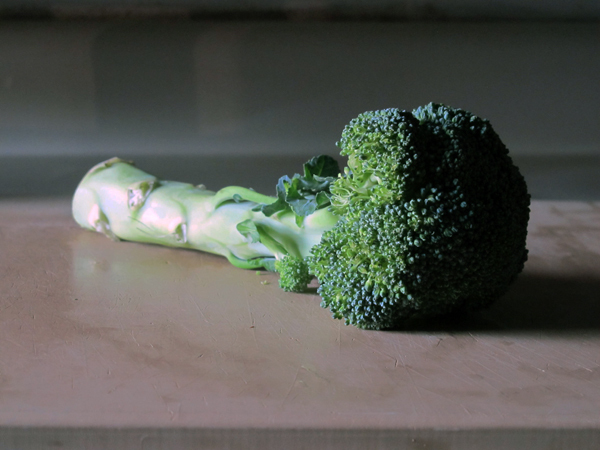 Chop off the stalk of the broccoli. Break or cut the top part into florets of roughly uniform size. Then use a vegetable peeler to peel off the outer layer of the stalk. Towards the bottom you may want to use a paring knife because the outer skin can be pretty thick and woody. Cut the stalk in half lengthwise, and then into 1-inch pieces. 3. Combine the broccoli florets and stalk, garlic, a big pinch of salt, a pinch of red pepper flakes, and a tablespoon or so of olive oil in a roasting pan, tossing with your hands or a spatula to coat. Transfer to the oven and roast for 16 to 20 minutes, stirring occasionally, until a paring knife inserted into one of the stalks meets no resistance. Add a few drops of lemon juice to taste, then let cool before assembling the sandwiches. 2. In a heavy-bottomed sauté pan or saucepan, heat 1/2-inch oil over medium heat. Add the onion rings and cook, stirring gently, for 6 or 10 minutes, until they begin to turn a golden-red color and crispen. Watch carefully because once they begin to turn red, they can easily burn. Remove from the oil with a slotted spoon and drain on a few layers of paper towel or a flattened out paper bag. Sprinkle liberally with salt. In an airtight container, the onions will keep for up to 5 days. I couldn’t agree with this post more on every level: As a sandwich aficionado, I completely believe that every right-thinking American should value the sandwich above all other type of food! (I’m only half joking.) And as a mostly-vegetarian I am 100% in favor of good vegetables in between two pieces of very good bread. In fact, I’m 100% in favor of very good bread, period. Can’t wait to make and demolish this some day soon. I have grown up with fried broccoli all my life….that’s longer than I would admit. I make a slightly different version beings that I am Italian. I fry the broccoli in olive oil and garlic. The garlic gives the broccoli a sweeter taste. Salt and red pepper to taste. I like my broccoli more wilted while some others in my family line it not as wilted as I do. Place it on fresh Italian bread. A great meal. Enjoy!